Gold in Ohio. Panning and Prospecting for Gold. 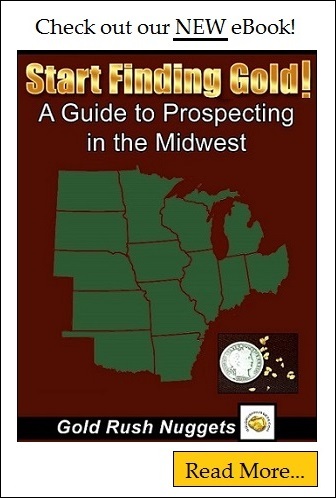 Ohio has many locations that you can pan for placer gold. Gold in Ohio has been left behind by glacial drifts thousands of years ago, and most of what you will find will be fairly small in size, although it is possible to find nice “picker” sized nuggets if you look in the right places. Since there has been limited interest in the past, there are certainly areas in the state that have had very little prospecting done, so don’t be afraid to try new areas. The nature of glacial gold deposition means that there could be gold literally anywhere within the state. Joining clubs will help cut down on the learning curve of how to find gold. Here are a few areas that are known to have some gold. In Clermont County, gold can be found in Stonelick Creek and Brushy Fork. This is one of the better known areas in the state. Ross County has several creeks that have fine placer deposits. Richland County also has several creeks that will produce placer gold. As always, check the natural areas that gold want to settle including inside meanders of the creek, and behind large boulders. Other counties worth investigating are Franklin, Hocking, Licking, and Morgan. All have reports of small amounts of gold. As mentioned earlier, gold is likely to be found in numerous areas throughout the state, many of which may have yet to be discovered. Remember that unlike commercial mining, recreational prospectors are often tight-lipped about their gold discoveries. Just because there are no official reports of gold production does not mean that it isn’t there. Get out the gold pan and start searching!